Learn the basics of programming with C with this fun and friendly guide! C offers a reliable, strong foundation for programming and serves as a stepping stone upon which to expand your knowledge and learn additional programming languages. 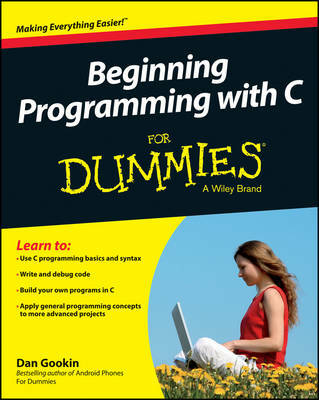 Written by veteran For Dummies author Dan Gookin, this straightforward-but-fun beginner's guide covers the fundamentals of using C and gradually walks you through more advanced topics including pointers, linked lists, file I/O, and debugging. With a special focus on the subject of an Integrated Development Environment, it gives you a solid understanding of computer programming in general as you learn to program with C. * Encourages you to gradually increase your knowledge and understanding of C, with each chapter building off the previous one * Provides you with a solid foundation of understanding the C language so you can take on larger programming projects, learn new popular programming languages, and tackle new topics with confidence * Includes more than 100 sample programs with code that are adaptable to your own projects Beginning Programming with C For Dummies assumes no previous programming language experience and helps you become competent and comfortable with the fundamentals of C in no time.